I'm not sure what's going on, but I've seen several plays recently about angry people yelling at and being violent with each other. First was the story of battling brothers in True West, then the intersecting stories of gay men in the 1950s and today in The Pride, and now Neil LaBute's tale of two troubled couples - reasons to be pretty. Don't get me wrong, they're all brilliant plays beautifully staged and acted, but it's a lot to take in in a short time! The play opens with an argument between Steph and Greg. Steph is offended and betrayed by something that Greg said about her - that she has a "regular" face in comparison to a pretty girl. A small thing, but with huge consequences. Steph can't stand to be with someone who she thinks doesn't like the way she looks, as much as Greg tries to convince her that it's not true. So she leaves him, after four years of being together. The other couple in the play are their friends and Greg's co-workers, Kent and Carly. They seem to be happily married on the surface, but as the play goes on we begin to see just how much of a jerk Kent is. Which makes Greg's slightly offensive comment seem entirely forgivable. Thinking back, I don't think that the two women ever shared a scene together, which is interesting because their relationship is the strongest and most healthy. But their conversations take place outside of the play, and we only see the alternately friendly and contentious relationships between the other pairs - Greg and Steph, Greg and Kent, Greg and Carly, Kent and Carly. There's a lot of talking in this play, and it sounds the way real people talk, complete with swearing and talking over each other, inappropriate statements and humor. But there's also some action, as Greg and Kent's relationship comes to a violent end after Kent says something unforgivable about Steph. Ivey's "emerging artist" Anna Sundberg is believable and relatable as Steph, whose sense of hurt and betrayal is completely understandable (even if I wanted her to forgive Greg). By the end of the play, Joseph Bombard's Greg turns out to be a sweet, smart, nice guy and a good friend, despite his flaws and the fact that it was his blunder that started the whole mess. You really empathize with him through all the ugliness, and we're left with a little bit of hope that his life will get better. Andrew Sass has a little bit too much fun as the creep Kent who's cheating on his pregnant wife and has absolutely no guilt about it. As has happened a few times recently, I felt the urge to boo him at the curtain call because his character is so unlikeable! Rachel Finch is sweet and strong and vulnerable as the wronged woman Carly, who knows there's something going on but doesn't want to admit it. The cast plays and fights together very well in the various combinations of characters. reasons to be pretty is an interesting reflection on appearance and beauty. Something that we really can't get away from in this culture, as much as we might like to think we're above it. 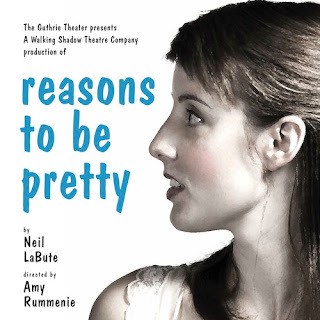 This play seems to present more reasons NOT to be pretty, as being pretty causes all sorts of problems. Or rather, people's reactions to and expectations of beauty. I love the Dowling Studio at the Guthrie Theater. It introduces me to theater companies I never would have heard of otherwise. Such as Walking Shadow Theatre Company, which I will now be keeping on my radar. Once again I caught this show just as it was closing (sorry!). But the rest of their season looks interesting - I do love an Oscar Wilde play! And as much as I've enjoyed seeing these heavy plays in the last week or so, after all this drama, anger, and violence, I'm really ready for a light-hearted musical comedy.